Re: Any other Infinity users seeing nightly packet loss? This has been ocurring on a daily, or more correctly a nightly, basis since Friday 5th October 2012. The problem seems to only be with sites routed via above.net. In general it all seems to start at ~7PM, gets progressively worse, and then starts to work again by 11:30PM - midnight. I've been getting huge latency on Plusnet fibre at those times, for the last few days, not caused by anything I'm doing. Click the BQM link in my sig . No noticeable packet loss. We are aware that some customers are having trouble accessing some websites and online services. 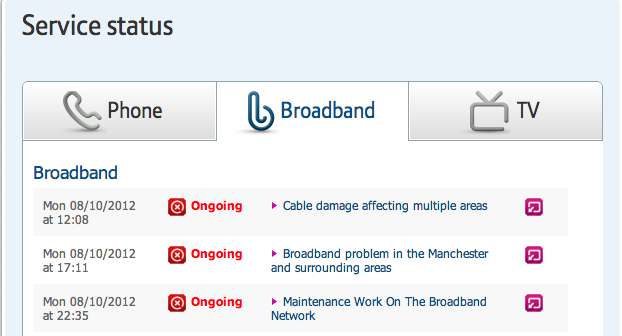 This is due to an issue with a peering network beyond BT�s service boundary. Our support team is working with a third party to resolve the issue asap. We would like to apologise for any inconvenience this issue has caused. A number of readers got in touch to tell us that they were struggling with BT's service due to a "major packet loss". The company's customer forums were also full of posts about the problem, which some claimed originated from overseas traffic going through Zayo-owned AboveNet in the US. El Reg understands that BT is not the only telco affected by the peering problems. I wonder what a Registered Trademark symbol is doing there?